In the past, Code Writer had a plain tile, which is still the case when no documents are open. In this screenshot, there are five documents open, sorted by the order in which they were last accessed. A checked box means that the document is unmodified. An unchecked box means that the document has pending changes that need to be saved. Also, as in previous versions, the number at the bottom right corner indicates the total number of unsaved documents that are open. The tile is also very intelligent and updates its display based on how big it is and how many documents are open. If in the above screenshot only four documents were open, it would switch back to a single column display mode so that longer filenames could be visible. In this screenshot, we've switched to a smaller tile. Since there are five documents open, not all of them can be listed on the four available lines. Thus we show the last three that were accessed, along with a "+ 2 more" to let you know that you have five total documents open. With all this information, you have a heads-up display right on your Windows start screen about what you're working on in the app. We love this new feature! End users have asked for printing support and we've delivered it in v2.0. You can print a document by opening the Windows 8 Devices charm or simply by pressing Ctrl+P. Once a printer is selected, a flyout will display that shows a preview of what will be printed. Numerous options are also available, such as the ability to turn off syntax highlighting, show/hide line numbers, or show/hide whitespace markers. 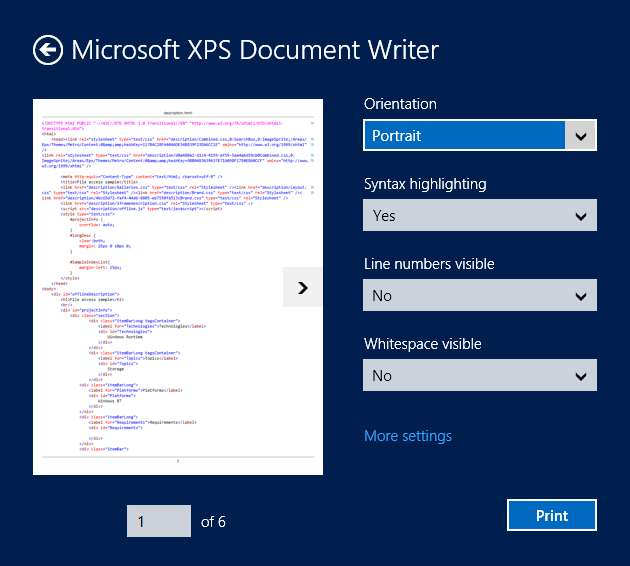 Since Windows 8 allows you to print to an XPS Document Writer, you can print right to an .OXPS file (similar to a PDF) and send it to other colleagues or review it later on other machines. The result is that the text after the caret moves two lines down and the caret indents on the middle line. This really helps typing efficiency. For some more detail, see the related SyntaxEditor post. 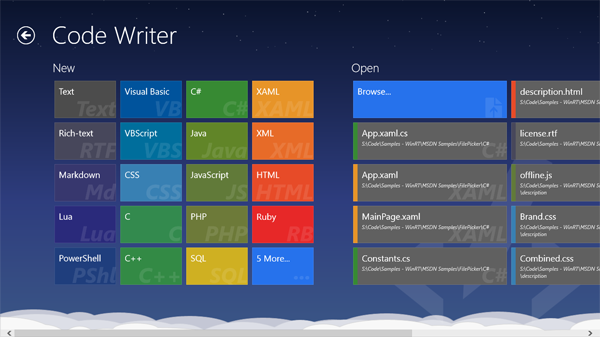 The twilight theme still keeps focus on the content as every good Windows Store app should, however it renders a night sky with a star field at the top, and multiple cloud layers at the bottom. Best of all, if you scroll the screen, you'll encounter parallax scrolling of the theme's elements. The Twilight background theme option can be activated on the General flyout via the app's Settings charm. Past versions of Code Writer supported clipboard copy and sharing via the Windows Share charm. In v2.0, we improved these areas further. Here we see the Share charm flyout, where I've shared the document I'm editing. Notice how now the text that is added to the message is fully syntax highlighted and line breaks are passed correctly, both of which are part of the v2.0 improvements. 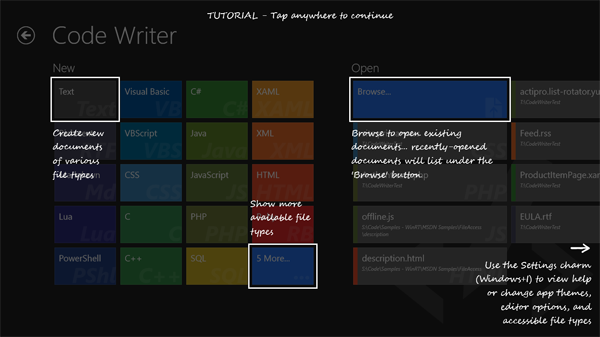 Copying text to the clipboard and pasting in other apps such as OneNote will also retain syntax highlighting. Code Writer is smart in that if you have a dark editor theme active, all the syntax highlighting used for sharing and copying will be done in the light background theme so that it shows up properly in other apps. This version adds protocol activation support. 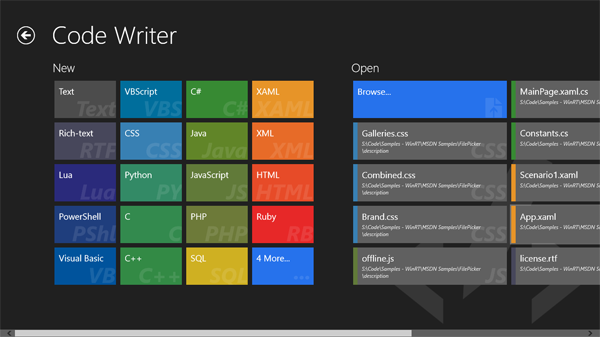 This means that you can enter codewriter:// in your browser to open Code Writer. codewriter://add - Opens the Add Document screen. codewriter://help - Opens the Help screen. codewriter://open?path=c:\document.txt - Opens the document at local path "c:\document.txt". 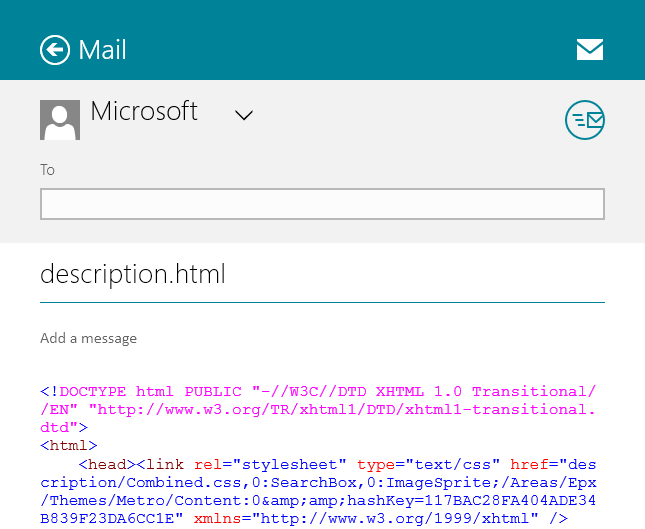 Note that due to Window Store app security, the file will not be accessible unless you have previously opened the document in Code Writer using the Browse dialog. In past versions, Code Writer would display a mostly textual introduction screen the first time you used it. We never really liked that concept and wanted a more visual tutorial. In v2.0, when you first visit the Add Document and Editor screens, you are now presented with a single page tutorial overlay that gives some quick tips on how to use the page. The screenshot above shows the Add Document screen tutorial. The mouse back button now simulates clicks on page back buttons. A Help button to access app documentation has been added to the Add Document screen's app bar. Minor user interface improvements have been made such as subtle outlines to the Add Document screen's items. Updated document save code to reduce memory usage for large documents. As you can see, this release adds a ton of great new features. Be sure to grab it. 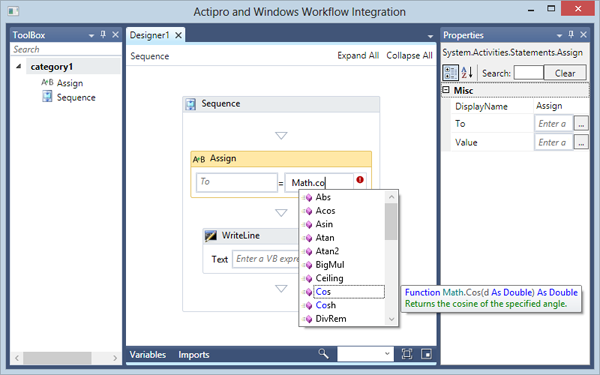 WPF Controls 2013.1 build 583 has been released and is now available for download. This build focuses on minor enhancements and bug fixes.